The more you want to accomplish, the more help you’ll need. You may not be able to do it all yourself. You may need support, help, advice and encouragement. Most successful people have a team to help, give counsel – a mastermind group. Start building your mastermind group today! Choose people with different talents and backgrounds. This support team will not allow you to get discourage, or not attempt something. They can also play devil’s advocate when needed. Chose people who love and support you and are not afraid to tell you the truth. That being said, you must be willing to hear the truth even if you don’t like it. This group can be informal or one that meets on a regular basis. Get as many perspective as you can. This will keep you moving forward. When asked, successful people will say that they did not achieve success alone. We need support, encouragement, ideas, friendship, love and kindness from others. 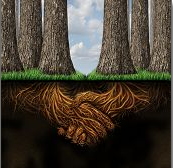 Having those connections and knowing powerful people will greatly increase your chances of success. This is not about going around and collecting a bunch of business cards. It is about creating deep and lasting alliances with good people. The next 10 blog posts I will be sending out (over 10 weeks) will help create these deep alliances. Please continue to follow along with me as we reach for this goal. It may be helpful to revisit (or visit if you missed them first time) my blogs about “Increase Your Natural Power”: Eliminate all those petty annoyances, Plug the energy drains, Install 10 daily habits, Eliminate the “shoulds”, Establish big boundaries, Don’t be a duck, Raise your standards, It’s all good, Have something to look forward to every day. The next 10 blog posts I will be sending out (over 10 days) will help create these deep alliances. Please continue to follow along with me as we reach for this goal. It may be helpful to revisit (or visit if you missed them first time) my blogs about “Increase Your Natural Power”: Eliminate all those petty annoyances, Plug the energy drains, Install 10 daily habits, Eliminate the “shoulds”, Establish big boundaries, Don’t be a duck, Raise your standards, It’s all good, Have something to look forward to every day.